This issue opens up with Harley having a one-sided conversation with the Eradicators before they fly into the Fortress of Solitude. Being drawn by a crashing sound from within. Batman mourns Robins (Tim Drake) death while Wonder Girl & Starfire take the battle to Zod. Both are knocked aside by Zod when Plastic Man, Luke, and Steel try their hand at him. While he’s still being held down Jonathan Kent comes with a Kryptonian Laser Rifle. But Zod is far from beaten and tries to Heat Vision the old man to death. Harley comes in for the save with the Eradicators but they are easily dealt with by Zod. 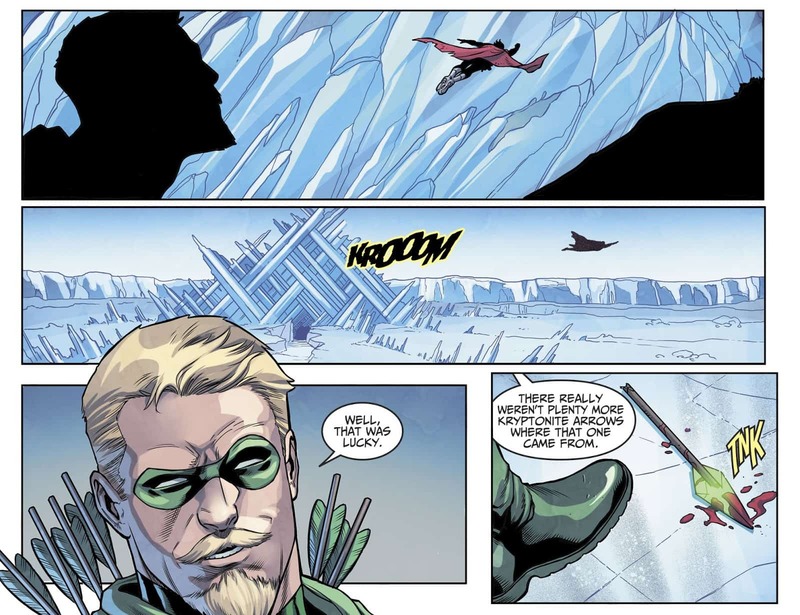 Green Arrow fires a Kryptonite Arrow that hits Zod in his shoulder and threatens that he has more. Zod flees and Green Arrow admits he really only had the one arrow. With the battle done, they go to check in on Batman. Harley says Tim was her favorite Robin and that Batman was better with him around. Batman agrees and says he’s going after Zod alone. Using Brother Eye, he tracks Zod and passes several special locks to his secret End Game weapon. Zod continues his rampage in the Arctic when a massive Batmech projection appears. 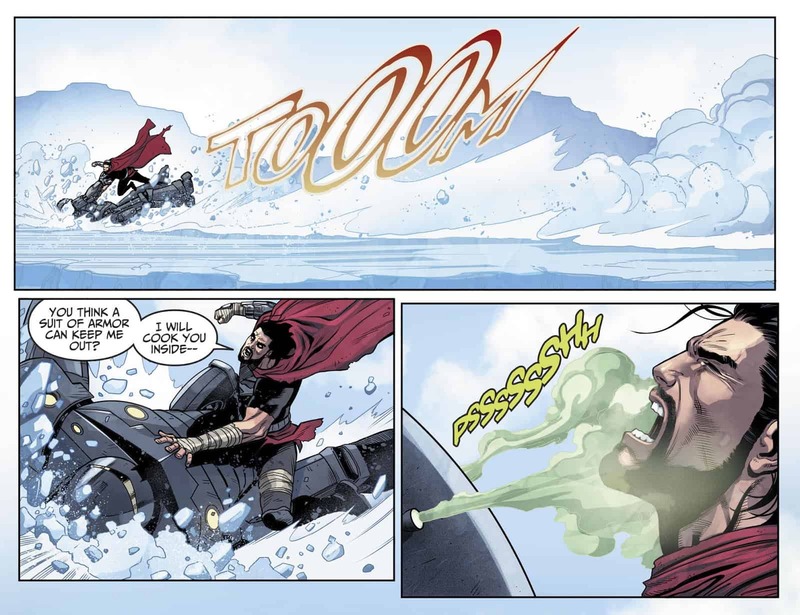 It says the same phrase he originally heard when he was first tossed into the Phantom Zone and is understandably angry. He proceeds to tackle the mech and prepares to destroy it only to get sprayed with a strange gas. Zod’s confused and Batman says the gas is a sample of the kryptonite gas and fear toxin cocktail Joker used on Superman all those years ago. He admits he could never use it on Superman himself but after Zod killed his son he wants Zod to be afraid of him for what he had in store. 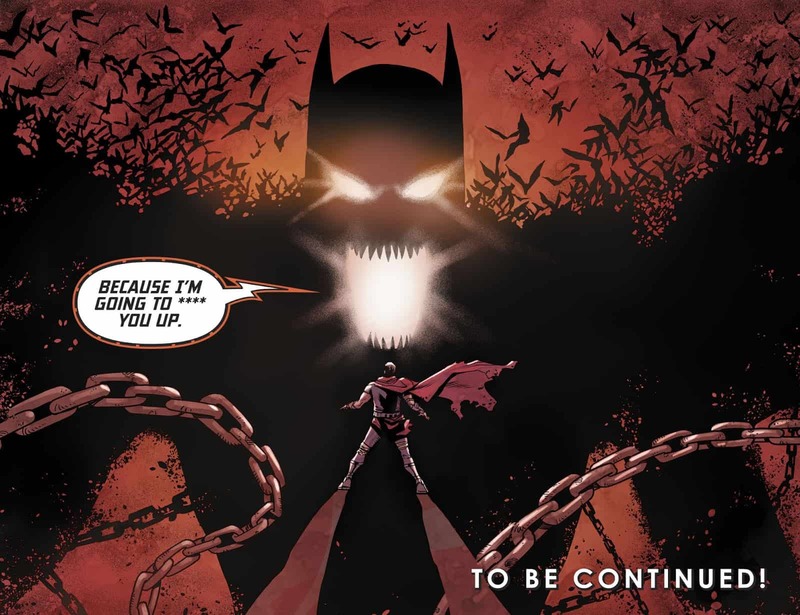 Tim Drake is officially dead, the Teen Titans are dispatched in seconds by General Zod, and Batman is the most pissed he’s ever been in Injustice. The infamous Kryptonite Fear Toxin makes a return and further raises morally ambiguous questions about the Dark Knight. But more pressingly, Starfire & Wonder Girl were no match for General Zod. Granted he’s a Kryptonian this makes you wonder if they’ll be a match for AMAZO or this whole desperate quest was just a pipe dream. If Batman always had this anti-Kryptonian weapon hidden away with only Brother Eye knowledgeable of it, what other weapons does he have hidden away? This was such an awesome chapter to read. We’ve seen Batman angry before but this is by far the most you felt his anger. Just the imagery on the last page and using the weapon responsible for ruining the world really setting that idea. It raises so many questions but in a good way and has you wondering what’s going to happen next. Granted, part of this is undermined by us knowing that the Injustice 2 game is after this, but the comics have shown the in-between can be just as intense. But not only does it have you wondering about the future, it makes you question the past and how many other shady things Batman has done or kept secret without others aware of it. If Brother Eye is any indication I’d wager this will just be the beginning.